Overview - Brimming with the energy, passion and music that rocked a nation, Hair is an entertaining and powerful tribute to the turbulent spirit of the '60s. Brilliantly recreated by OscarÂ(r)-winning* director Milos Forman and screenwriter Michael Weller (Ragtime), this vibrant screen version of the Broadway phenomenon ranks "among the best film musicals" (The Hollywood Reporter)! Fresh from the farm, Claude Bukowski (John Savage, The Thin Red Line) arrives in New York City for a date with the Army Induction Board, only to walk into a hippie "happening" inCentral Park and fall in love with the beautiful Shelia (Beverly D'Angelo, American History X). Befriended by the hippies' pacifist leader, Berger (Treat Williams, Mulholland Falls), and urged to crash a formal party in order to declare his love for Shelia, Claude begins an adventure that lands him in jail, Central Park Lake and, finally, in the army. But Berger's final effort to save Claude from Vietnam sets in motion a bizarre twist of fate with shocking consequences. *1975: One Flew Over the Cuckoo's Nest; 1984: Amadeus. Two words. Dancing hippies. Scene after scene of dancing hippies, actually, totally decked out in frivolous, flamboyant dress, with long, luxurious, flowing locks cascading over their fully dilated pupils, swirling in their eyes like black saucers through the cosmos, as they melodically ramble on and on about the virtues of peace and love. Still here? Good. It may sound like a terrible nightmare to some, but… it's actually sort of awesome. 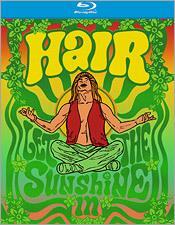 From Academy Award winning director Milos Forman (yes, in between 'One Flew Over the Cuckoo's Nest' and 'Amadeus', he made a movie about dancing hippies) 'Hair' is a wonderfully fun and humorous look at 1960s counterculture through good old song and dance. While it may not always work from a narrative perspective, there's no denying the comedic value found in its many musical numbers. The plot revolves around a naive young man from Oklahoma named Claude Bukowski (John Savage), as he travels to New York to enlist in the army. While in the big city he befriends a group of hippies led by wild man George Berger (Treat Williams) and falls in love with a rich, young socialite (Beverly D'Angelo). When Claude eventually heads off to training camp, the peace loving gang hits the road to say goodbye before Bukowski ships out to Vietnam for good (and we all know how well that worked out for him). The performances are all great and the cast does a fine job of juggling the musical, comedic, and dramatic elements on display. Savage plays Bukowski with a mixture of green inexperience and an earnest sense of responsibility and duty. Williams is also strong as the charming and rebellious hippie leader, pulling off a charismatic and surprisingly multifaceted role. As the love interest from upper class society, D'Angelo clashes against the other characters well and her gradual turn toward hippie culture is fun to watch. The various musical numbers are the real attraction here, and they all combine a deliriously tongue-in-cheek sense of humor with some truly memorable melodies. The lyrics, art direction and choreography simultaneously parody and lovingly celebrate the flower power era of the 1960s. There is an absolutely irreverent quality to the comedy that plays fast and loose with the shifting cultural norms and social taboos of the period's ever evolving values and customs. Lyrics contain references to everything from Fellini, various sexual acts, the delights of "chocolate flavored treats," and of course the merits of long, luxurious hair. Highlights include the oft parodied opening recital of "Aquarius" and an LSD fueled hallucination that features not just dancing hippies, but flying, dancing hippies. Director Milos Forman injects some exciting visual touches into these sequences, playing up the outlandish outfits and vibrant colors of the time with a flowing, swooping camera. Thankfully, despite his sometimes garish choices, Forman also knows when to show restraint. 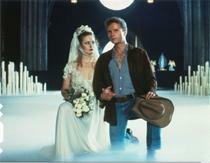 In fact, one of the most powerful scenes in the entire film is Cheryl Barnes's performance of "Easy to be Hard". Here Forman does away with the movie's frequent gaudy stylistic flourishes in favor of a few simple, stripped down but effective shots that let Barnes's commanding voice take center stage. Beyond the music, the script itself is good, reinforcing the humor in the lyrics with some fun dialogue and situations. With that said, the story does still suffer from a few minor setbacks. There are some pacing issues and the spacing out of musical performances in between plot developments can sometimes be jarring and uneven. The songs themselves don't always connect to the narrative either, occasionally coming across as out of place or extraneous. Character development is also a little thin, and friendships and relationships are formed with almost no build up. Bukowski's initial transition from naïve fish out of water, to integrated member of Berger's gang, happens almost instantaneously and doesn't really get the breathing room it deserves. The same can be said for Bukowski's romantic pursuit of Beverly D'Angelo, which is also underdeveloped. While the film is mainly comedic in tone, it does take a fairly sharp turn in the final act and the ironic and ultimately tragic ending seems slightly out of place. Though it does work well with a lot of the deeper themes running throughout, it's executed in such an abrupt manner that there isn't much time to process the events before the screen goes black. Going along with this, a lot of the deeper, dramatic undercurrents about counterculture and war never really hit as well as intended and sort of get lost in the otherwise playful shuffle. 'Hair' works best when keeping things light and musical. The script's sense of comedy is strong in both narrative and lyrics yet dramatic elements tend to falter a bit. Some may dismiss this film outright based on its seemingly cheesy subject matter, but there really is some genuinely funny and intelligent material present, that elevate this musical far above the retro relic some might assume it is. Through its irreverent lyrics and creative performances, 'Hair' affectionately mocks and champions the peaceful ambitions of a bygone era. Let the sunshine in, indeed. MGM brings 'Hair' to Blu-ray on a single region A, BD-50 disc in a standard case. The movie automatically plays upon startup, forgoing an initial menu screen. The film is presented in a 1080p/AVC transfer in the 1.85:1 aspect ratio. The video is a bit uneven, showing some age, but does look quite good in certain sequences. A light layer of grain is visible throughout. The opening scene set in Oklahoma is the most problematic and is riddled with print damage, showing off some excessive dirt, scratches, vertical lines, and specks. Thankfully, the film mostly cleans up after this point, yet still periodically features various speckles on screen. Detail can be very strong, especially in the first half, but the latter parts (with the exception of the impressive final crowd scene) present a somewhat softer image. There are instances of dimensionality present, particularly in some of the earlier music performances, but the majority of the transfer has a flat look. Colors are a little muted in some scenes, especially considering the movie's apparent vibrant palette. Black levels and contrast are good, though there is some crush in shadow detail. While the source could definitely benefit from restoration, the video is still acceptable if not terribly impressive. There are a few standout sequences early on, but for the most part, it's pretty average. 'Hair' is provided in an English DTS-HD Master Audio 5.1 track, along with several Dolby Digital mono and stereo tracks including Spanish, French, and Italian. Several subtitle options are presented including English SDH, Spanish, French, German and Italian. Remixed from the film's original stereo elements, the surround track is good, but not exceptional. Dialogue and vocals are nice and clean but do have a slightly thin quality. Separation is strong across the front speakers, giving the musical elements some welcomed distinction. Surround use is subdued yet still noticeably present with several music cues, providing a decent level of immersion. Balance is good but the track as a whole seems to be mixed a bit low. Dynamics are a little flat and bass is present yet never terribly deep. The music itself is fantastic but the audio lacks the full, encompassing qualities of modern mixes. Still, the track gets the job done just fine. Though not great, this is probably the best 'Hair' has sounded in quite some time. Really, MGM? You get me to like a movie about dancing hippies and then you give me no supplements?! No behind the scenes shots of the colorfully dressed extras learning their silly dance moves? No on-set footage of Treat Williams styling his impressive garden of luscious, manly locks? Was it even his real hair? Could it have been a wig? I need to know! Curse you MGM! You are a cruel mistress indeed. Theatrical Trailer (HD) - The film's original theatrical trailer is presented in 1080p with Dolby Digital stereo sound. 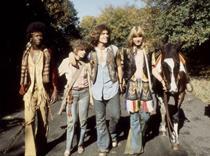 'Hair' is a fun, entertaining, musical look at hippie counterculture and 1960s America. Some aspects haven't aged as well as others and some of the more dramatic elements fall a little flat, but the film as a whole still proves to be much more than a mere retro oddity. Video and audio are acceptable but there are unfortunately no supplements. Still, the movie itself has an undeniable charm that warrants a recommendation even if the disc itself is lacking. Now go watch 'Hair' and have yourself a mystic crystal revelation.